The Supreme Court modified its previous order that provided for setting up of a committee to deal with complaints of dowry harassment. 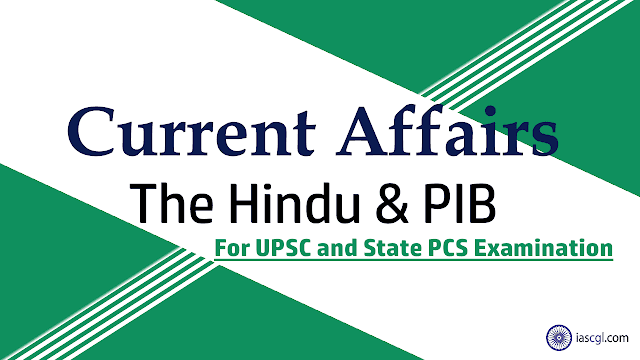 The court modified its judgment in the Rajesh Sharma versus Union of India case and took note of the "misuse" of Section 498A and said that the accused can now seek anticipatory bail. It is a cognisable and non-bailable offence. A guilty person faces up to three years in prison and shall also be liable to fine. The court had ordered ‘family welfare committees’ to be set up in the districts. Even the police could register an FIR only after the committee cleared the complaint as valid and not frivolous. SC had raised this concern over abuse of the anti-dowry law and had also said that no arrest “should be affected” without authenticating allegations as a violation of human rights of innocents can’t be swept aside. The judges accepted that such a committee would create an extrajudicial entity not envisaged in the Code of Criminal Procedure. The panel appreciated the “brave and timely” action of security forces for checking the PLA troops from continuing with their road construction. The Indian government late announced a slew of steps aimed at stemming a steep decline in the rupee, which has fallen rapidly this year, and it left the door open to announcing more measures. The Government announced a series of measures to boost market confidence, curb the widening current account deficit which touched 2.4% of gross domestic product and stabilize the rupee. To attract more Foreign Portfolio Investors (FPI) into the corporate debt market, the government has said it will review a couple of restrictions on their investments. So, the condition that FPIs’ investment in a single corporate entity cannot exceed 20% of its corporate bond portfolio will be reviewed. The government will review the mandatory hedging condition for infrastructure loans borrowed under the external commercial borrowing (ECB) route. Presently there is no compulsion on borrowers to hedge these loans. Manufacturing companies borrowing up to $50 million through ECBs will be able to do so only for a one-year term as against the three-year term allowed earlier. Masala bonds will be exempted from withholding tax this financial year and Indian banks will be allowed to become market makers in masala bonds including by underwriting. Masala bonds are rupee-denominated instruments issued abroad by Indian borrowers. The advantage of these bonds is that any depreciation in the rupee will not affect the borrower. The government will take necessary steps to cut down non-essential imports and increase export. India climbed one spot to 130 among 189 countries in the latest human development index released Friday by the United Nations Development Programme. Within South Asia, India's human development index (HDI) value is above the average of 0.638 for the region, with Bangladesh and Pakistan, countries with similar population size, being ranked 136 and 150 respectively. The UNDP report stated that with an HDI value of 0.64 compared to 2017’s 0.636, India is categorised as a medium human development and that its rank rose one spot compared to the 2017 HDI. According to the 2018 findings, between 1990 and 2017, India’s HDI value increased from 0.427 to 0.640, an almost 50 per cent increase, which is an indicator that millions have been lifted out of poverty. At the same time, in what signals the glaring inequality in the country, the HDI value declines by more than a fourth when adjusted for inequality. 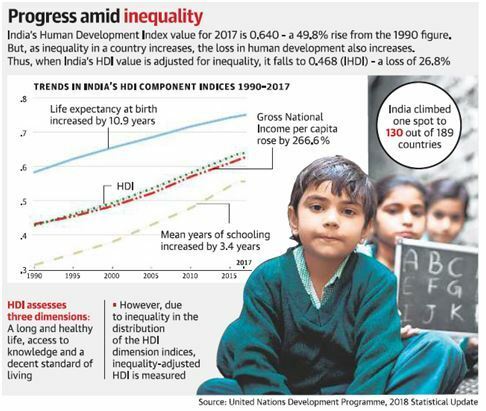 The value of India’s Inequality-adjusted HDI (IHDI) falls to 0.468, a 26.8 per cent decrease, far worse than the global average decrease in the global HDI value due to inequality at 20 per cent. Only 39 per cent of adult women have reached at least a secondary level of education as compared to 64 per cent men. India’s worst performance on the gender scale is with regards to its female participation in the labour market which is 27.2 per cent compared to 78.8 per cent for men even as globally 49 per cent women are part of the labour force as compared to 75 per cent men. Niger is the bottom at 0.35. The worst decline was seen in conflict-hit countries of Syria, Libya, and Yemen. Google has remembered them by making a doodle on the occasion of the 157th birth anniversary of great engineer M. Vishwaswaraiya. M. Vishweshwaraya, whose full name was Mokshgundam Visvesvaraya, was born on September 15, 1861 in a place called 'Issaahahalli' in Mysore (Karnataka). His birthday is celebrated as Engineers Day (Engineer's Day) all over India. In the exceptional work of their engineering, construction of Kannambadi or Krishnaraja Sagar dam in Mysore city was an important task. Its plan was made in 1909 and it was completed in 1932. He invented the new block system, under which steel doors were used to help stop the flow of water from the dam. These are also Diwan of Mysore. Visvesvaraya had designed and planned the entire area of Jaynagar in South Bangalore. The foundation of Jaynagar was laid in 1959. It is believed that this area he designed was one of the best planned areas in Asia. He wrote books titled 'Reconstruction of India' (1920), 'Described Finance System for India' (1934) and guided India's economic development. For his outstanding work, the Government of India honored him with the Bharat Ratna in 1955. He was also honored with the British Knighthood Award. He died on April 14, 1962. The Great Indian Bustard is the most endangered bird in the country and the Rajasthan government is trying to preserve its population. According to the IUCN Red List, in 1969, the population of Great Indian Bustard bird was approximately 1,260 and at present, its total number is less than 200. When the name of India's 'National Bird' was being considered, then the name of 'Great Indian Bustard' was also proposed, which was supported by noted Indian ornithologist Salim Ali. But due to the false accent of the word 'bustard' the 'Indian peacock' was chosen as the national bird. 'Great Indian Bustard' is a huge bird found on the land of India and Pakistan. It is one of the largest flying bird species found in the world. The Great Indian Bustard is known as the Flagship species of Indian grasslands. The scientific name of this bird is Ardeotis nigriceps, whereas Maldhok, Ghorad Yerchut, Godavana, Tukdar, Son Chirayya etc. are popular names of this species. 'Great Indian Bustard' is also the state bird of Rajasthan, where it is also known as Godavana. Due to unprecedented reduction in the population of 'Great Indian Bustard', the International Union for Conservation of Nature and Natural Resources has listed it under the 'Critically Endangered' species under threatened species. . Recently a hurricane knocked on the east coast of America, which has been named Florence. It is worth mentioning that this storm originated from the West Atlantic Ocean. Because of this storm, the US has declared an emergency in North and South Carolina as well as Virginia. According to figures released by National AIDS Control Organisation (NACO) it said it would not be an easy battle to end the disease as there are still around 21.40 lakh people living with HIV in India, with the prevalence among adults stood at 0.22 per cent. Estimations of adult HIV prevalence, annual new infections (HIV incidence), AIDS-related mortality, and prevention of mother-to-child transmission (PMTCT) needs are produced as outcomes of HIV estimations. The impact of the HIV/AIDS control programme has been significant, with more than an 80 per cent decline in estimated new infections from the epidemic’s peak in 1995.